If it turns out the universe is curved like a sphere, how far around would it be? ….It is a question of probability. In order for the universe to be flat, the density parameter Ω0 must be exactly one. According to the data collected from studying the microwave background radiation, the value of Ω0 is 1.02 +/- .02. Based upon this, the universe certainly appears to be flat, but let's take a closer look at precisely what the odds of it being flat are. So what does 1.02 +/- .02 actually mean? Well mathematically, the +/- .02 means that the probability of Ω0 being between 2 standard deviations above and 2 standard deviations below 1.02 (in other words the probability of Ω0 lying somewhere between 1.0 and 1.04) is 95.4 %. Based on statistics alone, the probability of Ω0 simply being greater than 1.0 is slightly higher at 97.8%. If our current measurements and calculations are indeed accurate and representative and if you rule out any other statistical factors for sake of argument, there is a 97.8% chance that the universe is positively curved. Now many would take a position that one cannot make such a leap. However, ESA, having been responsible for refining the value, would certainly challenge such position. And…... if the universe is indeed positively curved then it becomes only a question of just how 'large' the radius of the universe is. Using the mean value of Ω0 (i.e. 1.02) and extrapolating from our current best estimates for the distance from where we are to the edge of our observable universe, determined to be 46 bly, the radius of the entire universe (using the arc/chord method*) is calculated to be 133 bly. * The arc chord method assumes that the diameter of our observable universe (shown in colour) is measured along the curving circumference of the the total universe. 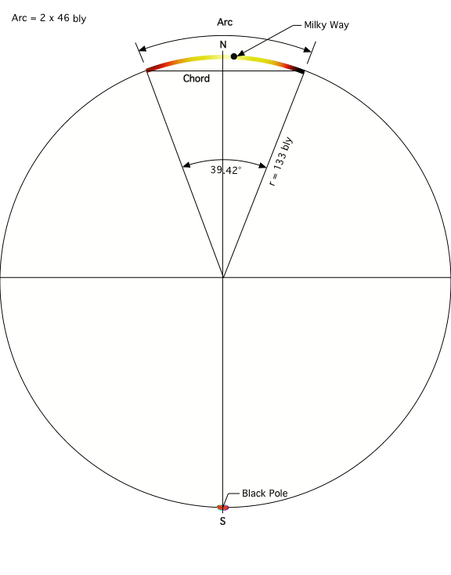 The radius of the total universe is calculated simply by the ratio of the arc distance (measured along the curve) divided by the chord distance and that this ratio of arc/chord is equal to Ω0 or 1.02. 2-dimensional Big Bang Shock Wave Model of the Universe based on Ω0 being equal to 1.02. The strongest pro Flat Universe argument against a curved universe is that the Planck data is not distorted sufficiently to support a positively curved universe. If you were assuming that the observable universe is almost as big as the entire, in this case finite, spherical universe, the point would have merit. However, if the actual universe is significantly larger than our observable universe the exaggeration of increased size of variations could be quite subtle. To be able to complete the picture of the 'curvature' we need to look more closely at precisely where the peaks of the power spectrum occur and we need to keep narrowing in on a more and more accurate value of Ω0.